The Reds and Dodgers kick off a series tonight between two teams jockeying for playoff position.Ã‚Â The Dodgers have been baseball’s hottest team over the past 2 months while the Reds have done pretty well since the All-Star break and are riding a series win against St. Louis. This series is big for the Reds because the club will have a chance to gain ground on either Pittsburgh or St. Louis as the two meet for the final time this season in a 3-game series.Ã‚Â Considering the Reds control their own fate with games against Pittsburgh, we all need to be Pirates fans over these next three days while hoping the Redlegs can sweep the Dodgers. 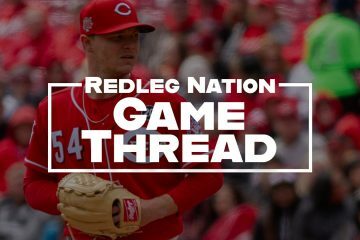 Discuss the game here fellow Reds fans! Need to win 2 out of 3. The Reds get a break here, with Capuano substituting for Ryu. Capuano did shut the Reds down in LA, but BP, Bruce and Votto all have good numbers against him. I was looking at the Dodgers’ batters lefty-righty splits, they hit righties especially well. Leake has to be at the top of his game. @pinson343: I’m hoping our offense surprises us tonight.. I have a good vibe after seeing Frazier/Cozart showing signs of heating up as well as BP/Ludwick/Bruce doing well. This isn’t the same offense I think that was on that west coast trip. I hope. next week, 2 of 3 from the dodgers would sound great…but we don’t control what happens tomorrow or Sunday. They are however, in control of what happens tonight. The old cliche’…one game at a time. Let’s go 1-0 in THIS game. So…assuming Atlanta holds off LA for the best record in the NL, would you rather win the Division and play LA, or go the wild card route for the chance to play Atlanta in the next round? I was going to post some snarky comment, but it actually is pretty interesting, in that the Braves do not look that fearful. I would hope the Reds can punch the Dodgers in the mouth this weekend and look like the team to beat. If the Reds come from behind and actually win the division would be pretty amazing so I think hands down I would vote against the wild card play in, even if it would be a guaranteed win. I live in Atlanta and the Braves have been amazingly resilient. Don’t lay an egg in front of Chicken Wing Joe and the Great 8! Let’s do them proud. After all, I wouldn’t be a Reds fan if it wasn’t for them. First game at Riverfront in 1975—broke my plastic souvenir Reds helmet within days because I was flipping it off my head trying to imitate Charlie Hustle. good story. That was the team that hooked me as a fan as well. …..and it’s fitting we play the Dodgers. Man, we used to have a real good rivalry with those guys. Raise your hand if you hated Steve Garvey with every fiber of your being. The Penguin, not so much. @Sultan of Swaff: Hand raised. Time for Leake to up his game for the Reds championship run. Going from college straight to the majors is already quite a feat. If Leake can get hot during this run he can become one of those stories the national media loves to talk about. Go Reds! Leake is lucky if he make the roster. Not saying he is doing that bad of a job, but if Cingrani can start and the Reds need a 4th starter, Leake is superfluous, even if Cueto and Marshall cannot go. If Jay Bruce hits .275, drives in 105, plays gold glove-worthy defense and leads the NL in extra base hits, doesn’t he deserve MVP consideration in a down year for position players? @Eric the Red: Maybe but it won’t matter. Buster Olney actually talked about considerations for MVP on a podcast this week. Talked about how much storyline plays into it, strongly intimated that McCutcheon would win, and apparently his WAR backs that up. I can see it. I think Bruce deserves consideration and some second or third place votes, but I tend to agree with Olney–either McCutcheon or Kershaw, though the Kershaw case is more complicated, IMO. @VaRedsFan: Agree, but he did. I’m sorry, but I find Jim Day insufferable as a gametime commentator. I can’t tell you why, but I’m thinking of muting it. @ToledoRedsFan: As much as I was looking forward to some Vin Scully, I remembered: he doesn’t call away games anymore, the LA guys are complete tools. Really don’t understand why Leake is so determined to throw a pitch right over the plate with two outs, an open base, and weaker hitters due up next. @Baseclogger: Sorry — not meant as a reply to the Jim Day comment. I really believe Puig , like Harper, is going to run himself into an outfield wall, literally, and dramatically cut his career short. Probably not tonight, though. @wildwestLV: History shows the young, talented, arrogant players run into trouble. Strawberry, Gooden … it’s happened before and I see similar stuff with these kids. Who the heck is Chris Welsh working with on the mlb tv broadcast. Never heard him before. @VaRedsFan: I try not to tell others how to comment, so I’ll ask politely: please, please, never write “HamRam” or anything like it ever again. Pretty please. @Eric the Red: Or even HanRam. HanRam gets on base with a single. Until he gets out that is what he is called. The offense better step it up tonight. This is not gonna be a pitcher’s duel. Speaking of MVP’s….Ramirez would be a lock, if he played the reds every game. If Leake gets a playoff start and Cingrani doesn’t I may give up on Reds baseball. @Eric the Red: Bank on it. Playoff series, Leake WILL be the 4th starter with Cngrani in the pen. Absolutely guarantee it. Why? Bakerman. Next please. But just imagine the match ups you can create with another Lefty out of the pen. I’ve felt bad about this game all day. Now I know why. I’m much more interested in how the Dodgers read Latos & Bailey. It will not surprise me to see them tee off Leake. Why couldn’t Edinson Volquez start for the Dodgers, this series? Can’t believe LA picked him up. Guy hitting .195 didn’t get a hit. Surprising. Its too bad the Dodgers turned it around, probably save Mattingly’s job. Dusty sure would look good sitting in the Dodgers dugout wearing Dodger blue. Go Reds!!! I really hope Joey breaks out of this slump in the one-game/play-in. That would be sweet. We’re guaranteed to lose ground on either the Pirates or Cards this weekend with Grienke and Kershaw pitching the next 2 days so we absolutely have to win tonite to avoid losing ground on both teams. You know you’re dealing with a bad manager when the leadoff hitter is hitting .195 and nobody even bothers to complain about it. Am I the only one who thinks that, talent aside, Yasiel Puig is probably a major prick, or at minimum is very, very immature? @ToledoRedsFan: I bet he’s friends with Manziel. @ToledoRedsFan: I think that is a safe assumption. @ToledoRedsFan: I think the better question is whether anyone DOESN’T think that. Is Leake getting squeezed as much as gameday says he is? @VaRedsFan: Maybe nothing blatant, but he hasn’t gotten any of the borderline calls, and any of them could have been called strikes. @VaRedsFan: There was one that I think was literally down the middle of the plate, thigh high. And at least one other that surprised me. So I guess my eyes match gameday. @vanwilder8: I’m not sure what Gameday is saying, but he’s definitely getting squeezed. @Baseclogger: Looks like he’s painting the corners and not getting any calls. Leake is throwing too many pitches. It took ESPN to help get Cozart out of the 2 hole. Maybe Sunday night they can help keep Choo from leading off vs Kershaw. Maybe Choo is leading off because Baker had a hunch the starter would get hurt. @Baseclogger: I was just thinking that. He’s a genius! They’re just trying to throw our best hitter off his game. @vanwilder8: Cingrani won’t be hitting tonight. @vanwilder8: Leake isn’t up yet. Halfway decent crowd at the old ball orchard tonight. C’mon Reds gotta score some runs. Go Reds!!! @Sergeant2: So maybe the “kids are in school” argument holds some water. This guy is the Illustrated Man? Yes? I think they got this guy from the Mat Latos fan club. Cozart was “bedazzled” by his ink. Baker isn’t going to challenge Gordon being inside the running lane? Looked like it to me. I’d pitch to 1st for 30 minutes straight. Hope we can hit Barney. I can’t stand Thom, so I shouldn’t complain. But can someone please ask Jim Day to shut up once in awhile? Leake smacked that ball pretty good. Gotta nice swing. 2 of 3 will be a major breakthrough. I just hope we don’t get swept…we r known to have one good series and go back to frustrating mode. Chris Welsh and Jim Day have zero chemistry. I get the impression Chris finds Day annoying. You would think they would have the “A” teams calling a big series like this one. Where’s Marty? @Sergeant2: Charity golf outing, I think Fay said. Have we run out of things to be negative about to the point we’re now having to bash poor Jim Day? @kywhi: Stop it! Your making me tear up. Mattingly did a nice job with the shift to the bullpen. Gotta wonder if Dusty would have managed it that way. Probably not. Remember earlier in the year before the Dodgers caught fire, there was serious talk about him being fired? A sense of your own survival focuses the mind. Perhaps Bob should take a note from the Dodgers and publicly keep Dusty on the hot seat. Oh if wishing made it so. I do not follow the bullpen question. Are you suggesting Dusty would have done something different? Gave Leake a K there. Just got another break on a call. He was probably safe there. Awful call (for the Dodgers). Game moves on. Anyone catch the Fay piece about Votto, calling him over & getting the rundown on his “streak”? Good read. Y’know, I’m getting really sick of Ludwick swinging at every piece of junk the opposing pitcher decides to heave over the plate on the first pitch knowing he’ll stupidly hack at it. @ToledoRedsFan: Sorry, that was supposed to be a standalone comment. YÃ¢â‚¬â„¢know, IÃ¢â‚¬â„¢m getting really sick of people posting in others thread when it was supposed to be a standalone comment. Baby steps. A single. I’ll take it. Joey remains above .300 and gives us a nice start. Somebody else needs to do something good. @vanwilder8: Not sure if it’s a must win, but with Kershaw and Greinke going it’s more likely than not we’ll get swept if we win tonight. Wainwright, Lynn, Kershaw, Greinke, Loriano, who is next? Time to do a little bidness!! Well at least it scored a run. @CharlotteNCRedsFan: Ludwick clearly doesn’t get paid by number of pitches seen. Ludwick trying to keep the Bakerman happy. @JCTENRED: As was thinking more like Votto getting thrown out at home. Never look a Gift Horse in the mouth. YÃ¢â‚¬â„¢know, IÃ¢â‚¬â„¢m getting really sick of Ludwick swinging at every piece of junk the opposing pitcher decides to heave over the plate on the first pitch knowing heÃ¢â‚¬â„¢ll stupidly hack at it. Boy, that DP looming large now. Votto gets on base. Reds score. Not a coincidence. Votto gets on base.Reds score.Not a coincidence. Ludwick comes up with a runner on 3rd and 0 outs; Ludwick is on my fantasy team; Ludwick fails to get an RBI out of it. Not a coincidence either. Cozart hitting .314, Reds 14-10 since he moved out of the 2 hole. is obp more than Votto’s during that stretch? All that and 1 run..
Yup. Sounds like back to the way we play…. @tae: Well, it’s a start. @Sergeant2: I can’t bring myself to say it directly, but LET’S GO NOT PIRATES! @YorktownRed: Yes, he sure is. Maybe a couple of these can get down of the ledge now. Swept?? The only team doing the sweeping is our beloved Cincinnati Reds. Buck up, fellows! Leake did settle down and our boyz started to hit a bit. Let’s see if we can push that this inning. Leadoff walk to the pitcher. BP .324/.395/.647, Reds 5-3 since moving to the 2 hole. @vanwilder8: Good thing Dusty is teaching this kid how to hit. @vanwilder8: Several of the hitters on this team seem to be more comfortable in some slots in the order. on a related note what is Votto slash line during this time before the HR tonoght? Here come another never-ending barrage of lefties from the bullpen! Let’s hope they don’t have as many as the Cards. Love the way Mattingly manages… what a difference.. Dusty would be just chewing his customized toothpick and snoozing .. dreaming about his beach home ..
Good job Choo. Please no bunt here. @YorktownRed: Then again, perhaps a bunt wouldn’t have been so bad. Crap. @CharlotteNCRedsFan: Votto’s not up yet. Holy crap, Choo got a hit off a leftie. Good job Mr. Choo. Continue that upward trend. Isn’t Uribe like 60? How can he even bend over anymore? @msanmoore: He sure does look it. …and that is why Phillips should be the lead-off hitter. Less opportunities to hit into those. That’ll do Votto. That’ll do. Yes sir !!!! You can’t keep a good man down forever !!! There’s your 2-out RISP hit, haters. @vanwilder8: Don’t hate the haters, hate the hate Fan Club boy. Well Joey, it’s about time. We missed you. Joey Votto hits number 22 couldn’t happen at a better time after that deflating double play. 3-2 Reds. Go Reds!!! Wouldn’t it be nice if Joey and Jay caught fire and carried this team to a title? @vanwilder8: Yes. Yes, it would. Votto now with 9 HR against lefties. Most in the league for left handed hittes, and only Upton and Goldschmidt have more against lefties as right handed hitters. Our boy Jay has 8, too. Nice power against lefties. All of a sudden with have Mike Leake with 6 very solid innings. How do you like that. Another solid inning for Leake … short leash in the 7th for him. Let’s add at least one and then hold them down! @msanmoore: Leake has been on his game tonite – only two hard hit balls, both by Hanley, but I agree with the short lease. He’s at a point where he could suddenly lose it. Problem is, with Hanley and Ethier coming up, it could be 2 runs in a big hurry. Wonder how long it will take before people start complaining that Votto didn’t hit a three run homer. @prjeter: That’s what I’m chalking this up to. @tae: Yes, it’s about time the guy leading the league in OBP contributes. @Baseclogger: Last night I got admonished something fierce for suggesting that those who think Votto should walk less are implicitly arguing in favor of him to swing at pitches out of the zone. So maybe numbers don’t matter? I dunno. 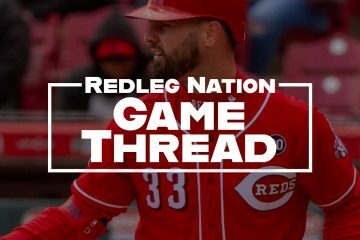 @ToledoRedsFan: As far as I can tell, the only thing that matters is that Votto never goes into any sort of slump and drives in runs almost every at-bat. Anything less than that and he isn’t earning his money. @columbusreds: He’s struggling, but has continued reaching base. That’s a contribution. One of the things that makes Votto so good is that he continues reaching base even when he’s not hitting the ball well. Very few other players can do that. People need to start appreciating it. @Baseclogger: Right. He’s struggling in one sense. He’s not struggling in another sense (and BTW, getting on base leads to runs scored which leads to winning ballgames). To simply say “he’s struggling” and leave it at that is a pretty one-dimensional way of looking at it, IMO. @ToledoRedsFan: Agreed. When Frazier went 0 for 32 or whatever it was, that was “struggling.” He did almost nothing in that span to help the offense. Votto has frequently contributed in games where he had no hits. Love that we’re digging deeper into their bullpen. Both BP and Cozart have hit into 17 double plays each so far this season. Surely every pitcher in baseball knows of the Reds tendency to swing at the first pitch. If a runners on 1st the opposing pitcher knows to make his 1st pitch his best ground ball inducing pitch. Like taking candy from a baby. @Sergeant2: This is partly why BP and Cozart are often asked to bunt (BP when batting 2nd). I’d still rather take the chance on the DP than give away the out. @pinson343: Same here. I wanna see BP swing the bat. C’mon Pie-Rats! Put it to those Dirty Birds! 3-0 Cards bot. 3rd 0 outs man on 2nd. Another “Welcome Back, Joey” stat: He has the most hits in the NL for all players not batting 1st or 2nd in the order. That was one pathetic inning. Short leash for Leake Here. He gets gassed very fast. Joey didn’t get a hit last nite but he looked a lot better than the nite before. I’m not surprised about tonite, I assume that’s true for almost everyone on the site. Basecl. It is good to see him hit a clutch h.r. Nothing wrong with fans demanding best from our best player. @tae: He leads the league in OBP. Does he only get on base in “non-clutch” situations? No. So you’re just wrong. BP and Bruce have had a lot of RBI chances because of Votto. If they’re “clutch,” it’s only because a “clutch” hitter reached base for them to get their “clutch” hits. @Baseclogger: This is not a one man team. Close down the Fan Club and you will feel better. Relived as well. @CharlotteNCRedsFan: What an odd thing to say. @Baseclogger: You put too much pressure on yourself covering for him. Everybody loves Joey here. You can rest. Seriously. @CharlotteNCRedsFan: You put too much pressure on yourself worrying about what I’m talking about. Maybe you should focus on whatever it is you want to say, and let me handle what I want to say. Sometimes blogs work that way. @Baseclogger: Just sounds like a schoolgirl crush to me. It’s not becoming of you and I know you got better in you. I’m done with counter stuff. Just thought it was fair for you to know. Make that 4-0 Cards still 0 outs in bot.rd. This would really be a confidence boost … give up a dinger to Hanley and then buckle down, keep them from getting anything more, and scoring. It has to improve the outlook given what we’ve done this week. It would be nice to get 1 more inning out of Mike, with Chappy not available. Starting next inning, Dusty should maintain double-barrel action in the pen and play the match ups if necessary. This game is ripe for the picking. Mike so far has sneakily made 1 of his best starts of the season. Only two hard hit balls, both by Ramirez, and the Dodgers would only have 1 run if it weren’t for Puig’s IF single. Just the same, have someone warming up, Dusty. The last 4 guys look like they are semipro hitters. Votto may be leading obp but what of other cat? With any players of his fame and paycheck will always get more scrutiny fair or not… it is the way sports reality is. Until votto shows he can perform more consistently in clutch and more so in playoffs i m not convinced… to me he is just a good player who walks a lot and focuses on stats too much.. It is merely my view..
@tae: Of other cat, he was 5th in OPS heading into this game. Do you know what OPS is? So this is where we get to see whether Dusty’s instincts are correct, leaving Leake in. With Kelch and Brantley on the radio, things seem a little more positive than usual for some reason. Had to take the dogs out … I see we didn’t score and just watched Leake make that FIIIINE play. How many balls have the Dodgers hit out of the infield? Really, really fine performance. Great call DB and fantastic game Mr. Leake. I would like to see Leake finish the inning, but I think Dusty is playing the smart move here (write the date down). Nice outing from Leake. He showed some resilience tonight. Leake’s been outstanding, but I agree with this. @pinson343: Yep – we’ve got a good pen for just this reason. 1 pitch from Parra and we’re on to the bottom of the 8th. I want to see the Dodgers crash & burn in the playoffs for one reason: Michael Young. Cherry pick your playoff contender. “Will go here, won’t go here…” Just go home. Is there any doubt the Reds are playing their best baseball of the season, right now? Crawford didn’t do the Dodgers any favors there. Thanks, dude. My thoughts exactly preach ! Let’s get some insurance runs here ! The Dodgers coming up in the 9th are scary. My better half is from Milwaukee and is a Brewer’s fan. Her family has season tickets to the brewers, so I would go to maybe a half-dozen games a year over the past few years. I saw Parra in Milwaukee. When we signed him I thought it was stupid because he wasn’t that good in Milwaukee. Ever since he turned it around this season I’ve been waiting for him to regress back to what he was in Milwaukee but it hasn’t happened yet. I’m not sure exactly what I should chalk this up to, but a lot of the credit probably goes to Bryan Price, who is clearly very very good at his job. Brandon’s not moving quite as quickly – I think he’s hurting more than a little. And as I type, Billy Hamilton is in to swipe a base (or 3). My favorite part of any Reds game. I like bringing in Hamilton. Another run here would be huge. Hammy is stressing them out. I like the boos. It keeps the crowd into the game. 3-3. Votto with a RISP opp. Not even an ATTEMPT at a throw … good thing as he’d be on 3rd if he tried to bounce one in there. Nice ! And now Joey, who’s been all kinds of confused this AB, can concentrate on hitting. 33,778 turned out for tonight’s struggle, 33,778. (Without Marty, there can be no “titanic” struggle. Time for a really big inning. Now would be a good time for a bunt. This guy is slow to to plate. Tempting to steal home? Still don’t understand why all season they’ve preferred to have a crappy pitcher in the pen (Partch, for example) who will rarely if ever contribute to a win and does nothing but mop up (which Izturis could just as easily do), rather than Billy Hamilton on the bench who can actually be a difference-maker. So Hamilton can develop every aspect of his game on a daily basis is one good reason. @ChrisInVenice: I suppose, but for brief periods of time he could really have helped this team, and instead they had Partch. It has been a long time since I have seen speed on the bases rattle a reliever. I don’t care if he’s one-dimensional. I don’t know if I’d put him on the 25 man roster for the regular season, but right here, right now, I FREAKING LOVE BILLY HAMILTON. This kid is a game changer. If he’s on first, the guy in the box gets better pitches to hit, period. Wonder what the record is for stolen bases without an at-bat. Short fly ball will be interesting. @George Culver: He could probably score on a pop-up behind 2nd. @msanmoore: I read a piece on him from SI earlier this year describing where Billy tagged up and scored on a ball that technically never left the infield. Granted, it was A-Ball, but still. This pitcher has a strange motion. The front office needs to get Hamilton an aerodynamic, skin tight uniform ASAP. Or at least something that fits. @MDredsfan: Hamilton dressing baggy because that’s the fashion now. @pinson343: true, but it looks like they’ve given him broxton’s uniform. Nice ABs by Votto and Bruce against a tough lefty. Brandon too, of course. Brian Wilson comes to the mound … and his ridiculous beard shows up a full 30 seconds before he gets there. Ludwick please, don’t swing at the first pitch. Going to the closer in the 8th? Dusty are you watching this? @George Culver: Wilson is not their closer. @George Culver: Except Wilson isn’t their closer. I’m starting to question the wisdom of not hitting lefties back-to-back because of the threat of late inning lefty relievers. I always wondered about pitchers named Paco. Gulp. Of all the luck. Going on contact … tough double-play. I’d be a little less grumpy if Ludwick had waited for a strike before whiffing at that garbage. At least Todd is holding off for now. That was a bizarre DP. As much as I’d like to, I don’t think I can blame Ludwick for that. @ToledoRedsFan: Except for swinging at Ball 2 and Ball 4 … no. He hit it on the nose and Wilson found it in his glove. That happens. Hamilton went on contact like he was supposed to. I understand Chapman is the closer, but if there’s some doubt about his ability to pitch four straight days, why not warm up TWO people for the ninth, and have someone ready if he isn’t sharp? @Baseclogger: Totally agree. This is risky at best. Hope DB knows what he’s doing here. Jim Day really needs to get “my bad” out of his vocabulary. Even with the fluke dp, it is good to see Votto and Bruce punk a lefty reliever for a second strait night. You gotta be kidding me? What crazy bad luck. Bases loaded with 0 outs and we do not score, predictable. Ludwick shouldn’t have moved the bat off his shoulder and it would be 4-2 right now. @Josh: He hit a bullet. @Josh: Wilson wouldn’t have thrown him 4 straight balls. And the ball Ludwick lined on 3-2 would have been called strike 3. Let’s hope Chappy tonight is the one we’ve been seeing. Chapman for the 4th nite in a row. Uncharted waters. Did that inning just happen? Bases loaded, no outs, no score. I’m pretty sure I’ve seen this movie already. Had to step away, came back to hear the words Dodgers get out of bases loaded no outs situation. Shirley I heard wrong. @Sergeant2: You did not hear wrong. And stop calling me Shirley. Guess we know who has the better Cuban. Good morning, good afternoon, good night!!! 99, 101, 102 … sit down!! Maybe Chapman should just pitch every day, period. OK, this will be the most dangerous batter of the inning. Hanley’s had a good night so far. Time for that to change. Heart of the order, here we come. @kywhi: Remember this next time he walks two guys and gives up a homer without retiring anyone. A case of the disappearing bat. Sweet. Ramirez K’s and the bat goes flying…and this one belongs to the Reds!!! Under 15 pitches … and 4 BEAUTIFUL outings! Incredible ! Three of the best hitters in the NL, and they couldn’t even manage a foul ball. @pinson343: They couldn’t even manage a foul tip. That is just not fair. Did he average 100 mph? Maybe it’s just me, but I think Chapman should pitch more than once every 12 days. @RedsAk19: Chapman’s rest has worked out well, but it was more than a week – 10 days – and it would not have hurt Aroldis to get an inning of work in there. Dusty didn’t use him all that time because there wasn’t a save situation. But I don’t want to complain about Dusty tonite – he’s made the right bullpen moves the last 2 nites. Joey – really great game. Folks, that was some good baseball! I’m exhausted. Chapman looks unstoppable right now. Joey is on the way back. Bruce has avoided the prolonged “funk”. And HOW ABOUT MIKE LEAKE!!! Who said the Reds weren’t fun to watch this year. HECK of a game!!!!! Great outing by Mike Leake. Everyone thought the Dodgers would shell Mike but he was outstanding. @Hunt4RedsOctober: I agree. And there was no luck involved, they were not hitting anything hard, except the 2 by Hanley. The Puig IF hit was bad luck, should have been a 1 run outing. I would have thought with Leake 1st inning, all the terrible AB’s and the use of Chapman this would have been a disaster. I am glad I am wrong. So I guess Chapman can go 4 straight days (I still think it is a mistake having him pitch yesterday). Is it just me or did sound a little negative? @Ethan D: I thought the same thing, but did like that he followed it up with the sentiment that winning is the main thing, not individual stats. @Ethan D: I take it as Votto expressing how much he likes playing in Cincinnati and he’s also saying that the contract he signed proves that. I’d be happy with the second coming of Bronson Arroyo. We know we can beat Greinke … if we do that we should just let Kershaw be Kershaw and maybe rest some of our guys. @msanmoore: Homer is facing him. And you never know. Kershaw recently lost to the Cubs in LA. @pinson343: It isn’t always the starter that you beat. What Homer has to do is keep the Reds in the game until the bullpens come into play. Baseball being a weird sport, teams look like dog doo one week, are unbeatable the next. An extended solid streak would be desirable … say win 15 of 22 … is that too much? @Johnu1: 15 of 22 might not be enough to win the division. In a short stretch like that, it’s possible to get hot and do even better. Birdies have apparently resumed their old habits … scoring runs. Thought I would mosey on over to the L.A. Times to see what Dodger fans had to say about the the game tonight. Of the two articles reporting on tonight’s game there were exactly 0 comments from Dodger fans. @Sergeant2: That’s how Dodger fans are. They’re more into the Lakers.